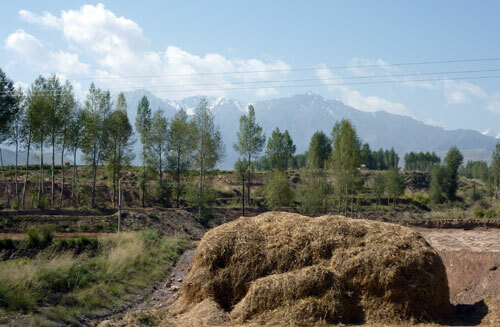 Once we’ve passed Zhangye’s outskirts, where a whole forest of gleaming highrises is springing up, and have negotiated the chaos of smallish lorries, pick-ups, tractors and loaded carts that convert the narrow, two-lane road out of town into such a nightmare, we can begin to enjoy the scenery. An initial rural stretch of fields, haystacks and little mud-brick farms descends into a dry, dusty bowl, after which the ground starts rising again and the land becomes fertile once more. A huge mountain range comes into view on our right and, to our amazement, we see that some of the peaks are covered in snow! 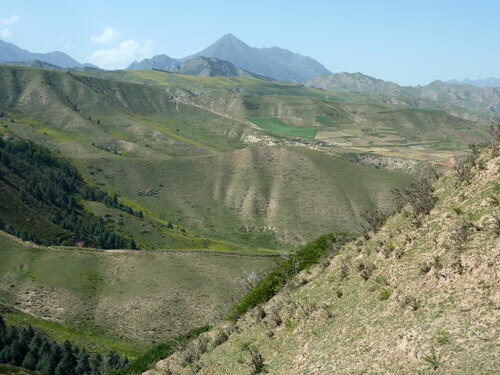 This is, of course, the Qian lian range in the foothills of which the temples of Mati Si can be found, and the people of the Yugur (Yugu) minority. The farmsteads along the road look very prosperous; they seem to have been newly-built along the same design: part brick, part white-tile buildings, surrounded by sturdy walls. Wherever the thick wooden gates are open, we can see tractors and other vehicles parked inside the compounds. Our driver tells us that farmers around here can make the equivalent of 10,000 Euros a year growing and exporting maize, wheat and a special type of peas to other parts of China … not a bad sum. The village just before the entrance to Mati Si looks brand-new: it boasts a gleaming administration building, a large school and a clinic with a shining ambulance parked outside. From the outside at least, it looks as if the local government is making every effort to develop the resident Tibetan community. Who knows if it’s really true. 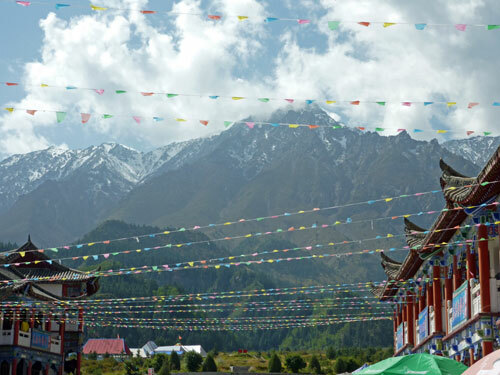 We pay a mere 35 Yuan to enter the area, a pittance, given how stunning the place is; we find ourselves in an Alpine valley with a crystal-clear river running through it, while meadows on both sides give way to forested slopes and rock walls. The road ends at a parking lot, surrounded by souvenir shops and snack stalls. 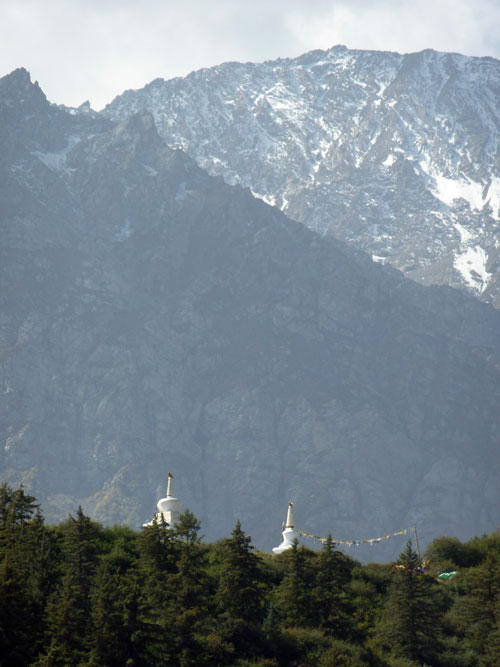 There are also several tourist camps of white-and-blue yurts where tourists can eat and sleep. 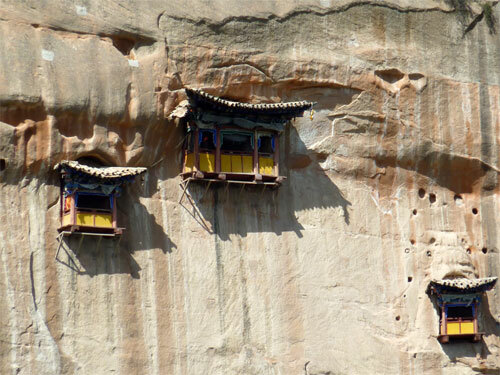 From here, you can walk up to a viewing platform that looks out over the rock temples, or climb up a steep flight of stairs for stunning views of the surrounding countryside. 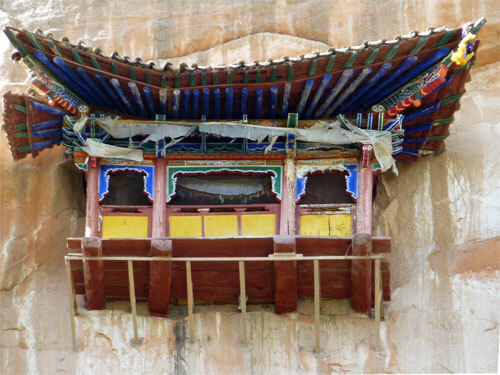 We decide to go for the temples first, and they present a truly amazing vision: an almost sheer rock wall opens in front of us, riddled with holes, caves and open galleries, with little wooden pavilions clinging miraculously to the rock. 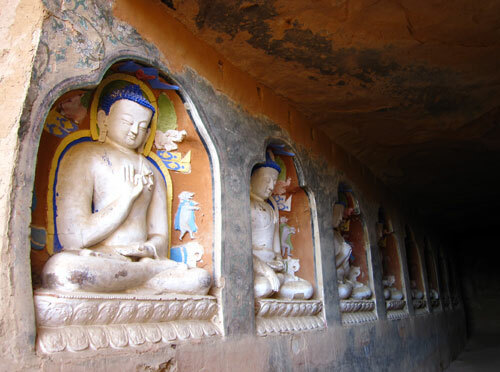 Traces of carvings and empty niches that once must have held Buddha statues further testify to the importance of this place. 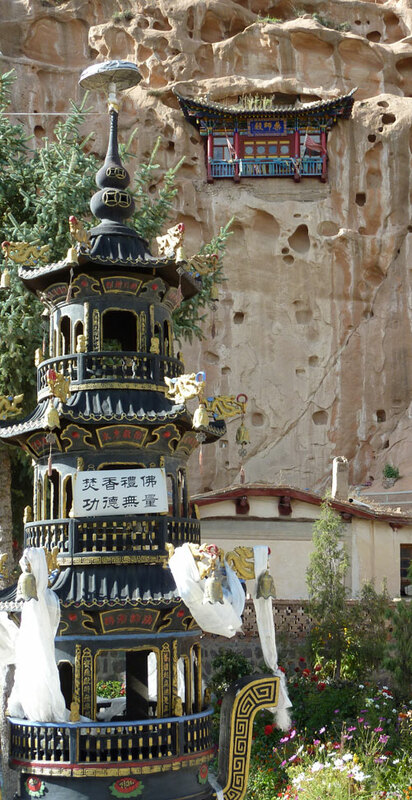 To actually enter the rock temples, a further 35 Yuan ticket is required; no wonder we had thought it was too cheap! 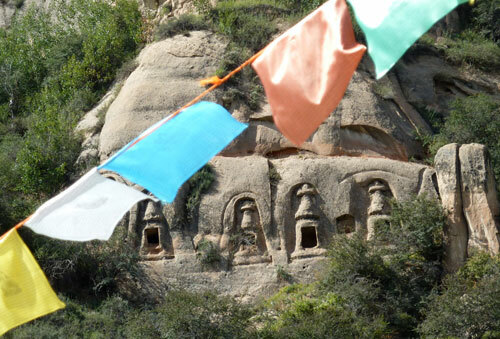 At the bottom there is a large cave, steeped in semi-darkness but packed with Buddha niches, some of them filled with nothing but rubble, but others still retaining (the original?) statues. 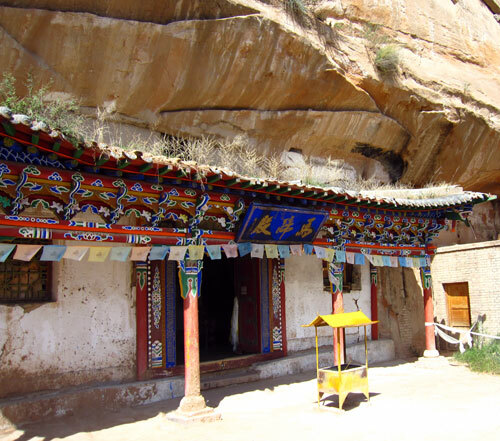 After visiting the cave, we make our way into the actual temples and up: this means squeezing through narrow passages and doorways and climbing dark staircases. We pass numerous small halls, some still showing traces of murals, and many now holding brand-new statues, the old ones having been destroyed during the Cultural Revolution. Sadly, most corridors and walls are marred by graffiti and the place could certainly do with a bit of loving restoration. When we come to the open galleries, some of which are now off-bounds for safety reasons, sweeping views of the surrounding countryside open up in front of us. 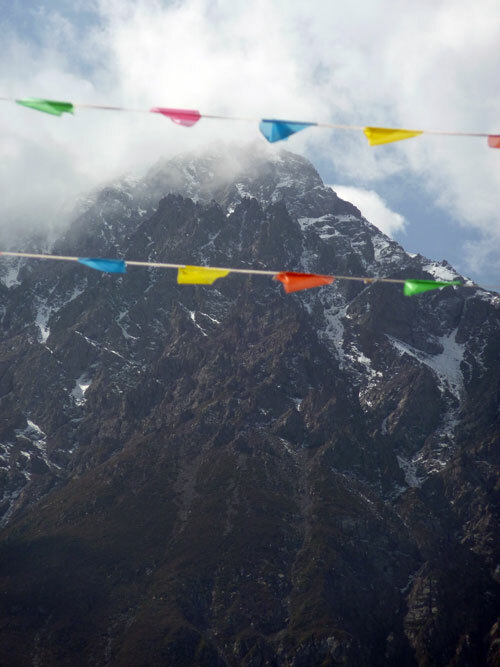 There are oodles of colourful prayer flags, suspended from the galleries, flapping in the breeze and framing the undulating green hills and snow-capped mountains. Near the highest point of the complex, our exploration comes to an end when we reach an interior temple hall, steeped in darkness. Once our eyes have adjusted, we can make out all the usual paraphernalia, such as colourful wall paintings, thankas, cases full of gilded statues, etc. It’s an atmospheric, though somewhat gloomy place. 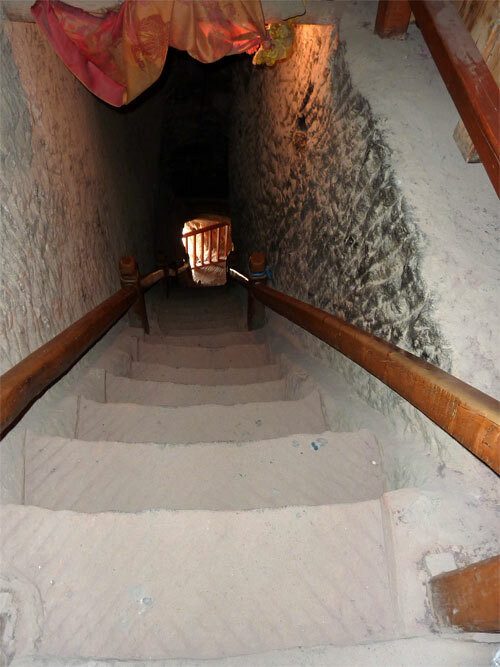 The way back is the same, though clambering down seems hairier than going up. After the rock temples, we climb up the steps to the viewing point. We collapse on a small meadow, which we assume to be the end of the path (though it isn’t), and from where we enjoy splendid views of a pine forest to our right, and a vast expanse of rolling hills and meadows to our left. We retrace our steps and make our way back down to the parking lot, but just before, there is a small temple to the right of the path. 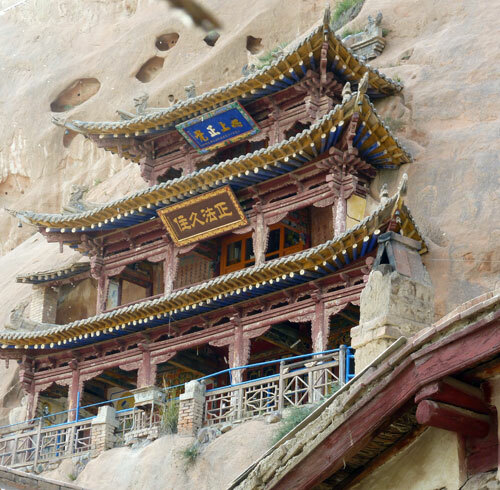 It’s a simple, old hall which, just like the cave temples, suffered extensive damage during the Cultural Revolution. 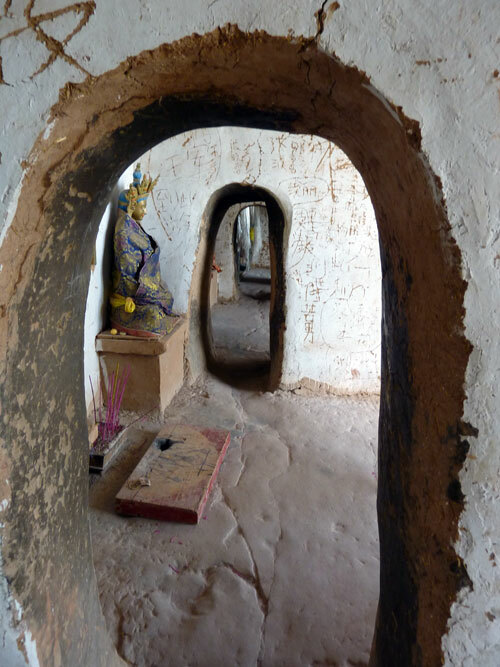 The ancient care taker tells us, vividly affected, how the Red Guards just threw the Buddhas out of the caves until they smashed on the rocks… He then unlocks two side chapels for us that hold shiny new prayer wheels and colourful murals. Afterwards, we cross the parking lot and go onto the wooden zig-zag bridge across the river. The bridge offers great views back towards the cave area we have just come from. We can see that the grass on the meadows already has a yellow tinge to it, while the bushes show touches of red where berries are growing, the first harbingers of autumn. 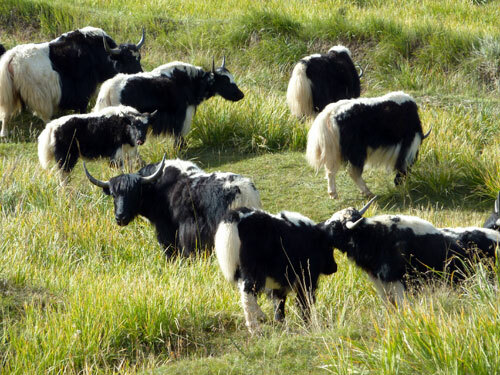 A herd of yaks is being driven onto the grass, their approach startling flocks of small birds like quail. 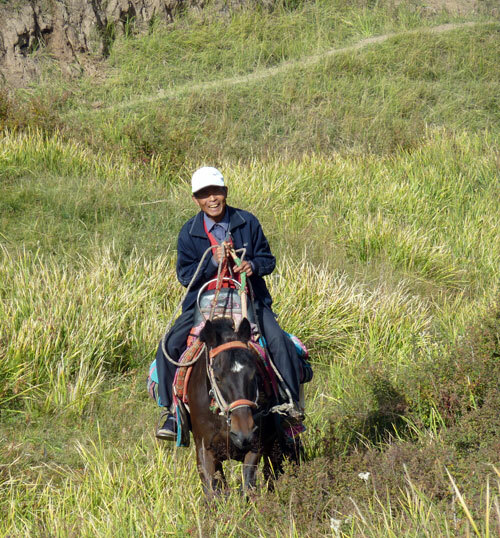 Enterprising locals go around, offering horse rides to scenic spots, or meals and shows of traditional dancing in the yurt areas. Having admired the magnificent views from all angles, we decide to give these offers a miss and head back to our taxi. 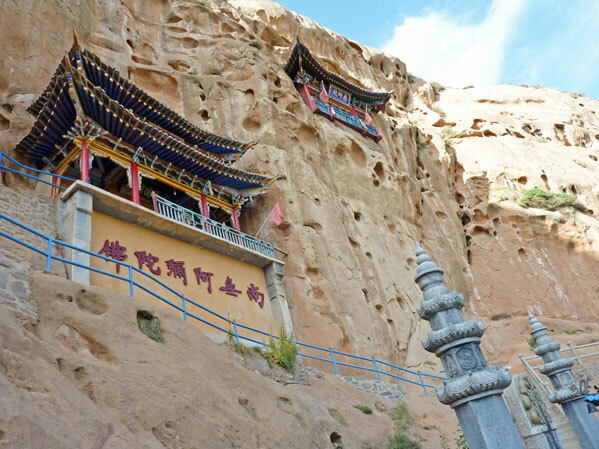 On our way back down, we have to make a last stop at the Thousand Buddha Cave, another rock temple. 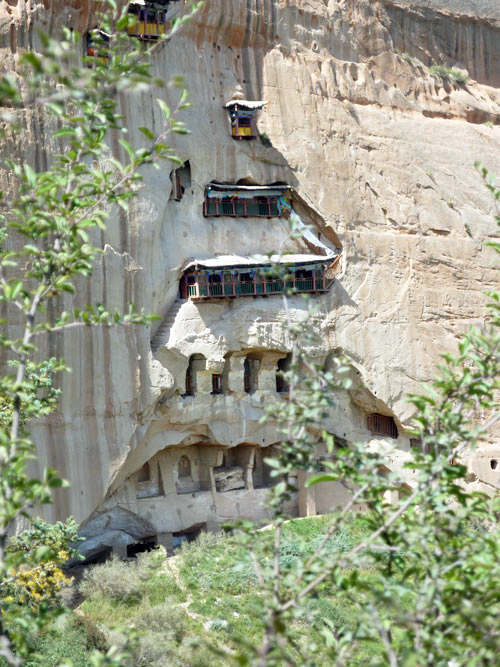 Though smaller than the main Mati si temples, it still occupies a whole rock face, pockmarked with caves and niches like a cheese. What most draws our attention here is the young girl guiding another group: she’s dressed in a fuchsia -pink skirt and tunic and a pointy hat, almost like a witch’s. We later find out that she belongs to the Yugur minority. A final look around and then it’s time to go back. 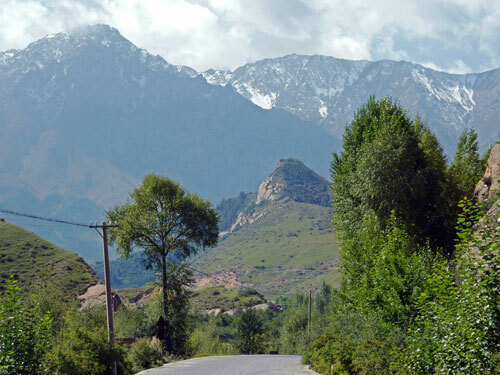 Apparently, the Yugur are a very small ethnic group of no more than 3000 people, the majority of whom have settled in Sunan Yugur Auronomous County, in Zhangye prefecture. They are the descendants of a nomadic tribe that originally lived to the south of Lake Baikal in Russia, and in Mongolia. During the Tang dynasty they became allied with the Han Chinese and gradually started migrating into Chinese territory. The Yugur are very similar to the Tibetans, with whom they share their pastoral lifestyle, as well as their religion; Tibetan-Lamaism. 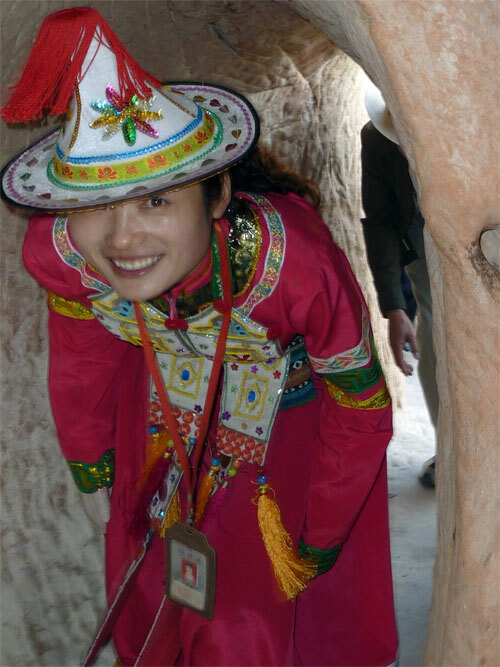 Yugur dress is extremely colourful, as we were able to see in Mati Si. 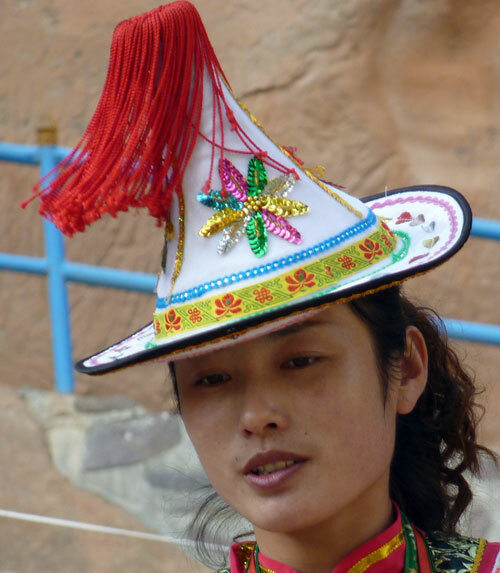 Women typically wear trumpet-shaped felt hats, topped by tassels, and their clothes are adorned with flowers, birds, butterflies, as well as many geometrical designs. 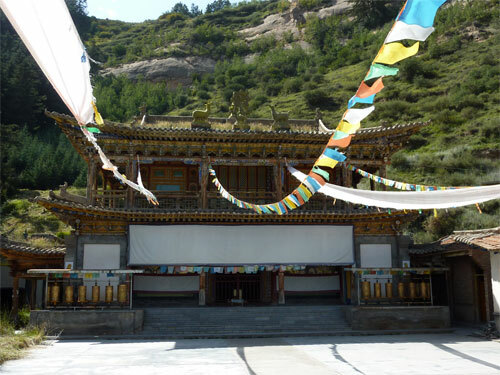 Entrance to the Scenic Area alone is 35 Yuan (and you can presumably stay more than one day), but to get into the temples themselves, you have to fork out another 35 Yuan. We went to Mati Si the easy way, by taxi, hiring a vehicle for the whole day (between 3 people) for 280 Yuan (We spent 8 hours at Mati si). 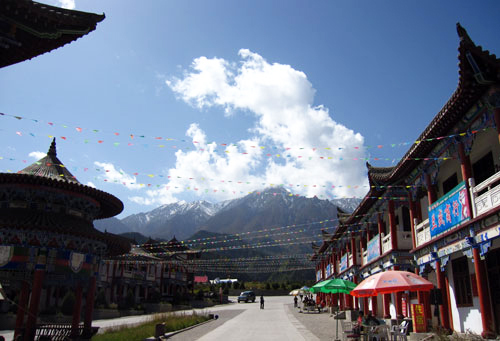 For public transport, you should first catch the bus to Sunan at Zhangye Nanguan Coach station in the south of town (leaving every thirty minutes), get off at Mati He village (7 kms from the scenic area) and then wait for a mini bus or catch a taxi onwards to Mati Si. The last bus back leaves around 16:00. 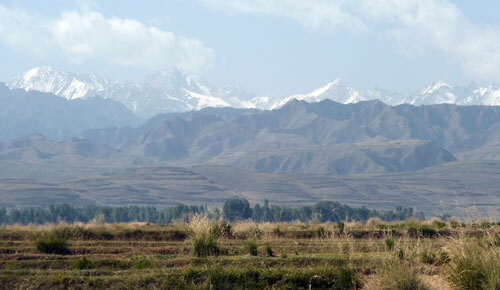 There may also be direct buses from Zhangye to Mati Si at weekends during the high season. The yurt camps can provide simple food and lodging between end of May and September, though nobody seemed to be staying there at the time of our visit. 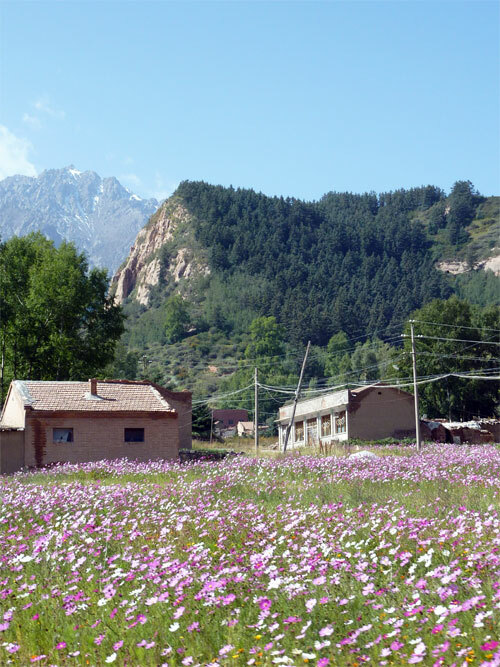 In the nearby village, you can stay at the simple Wolong Shangzhuang 卧龙山庄. There are some good hiking opportunities around Mati Si, such as the 5-hour round-walk that takes in Linsong Pubu 临松瀑布 (waterfall) and Jianpishi 剑劈石(Sword Split Stone). How absolutely amazing. It’s so beautiful. I can’t wait to go there. So many places, so little time. I love the photos and descriptions. Take me with you, next time. 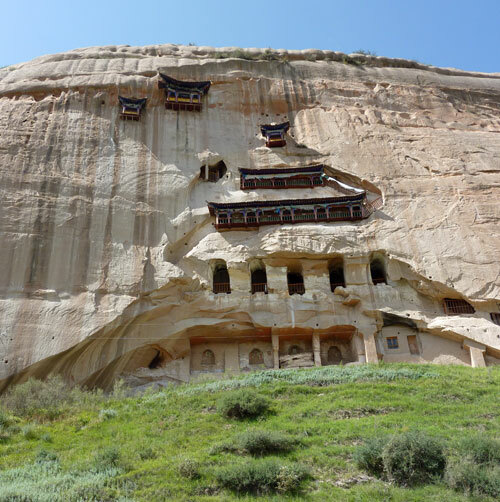 I did not know this temple was so interesting, for both stunning location and building hanging. 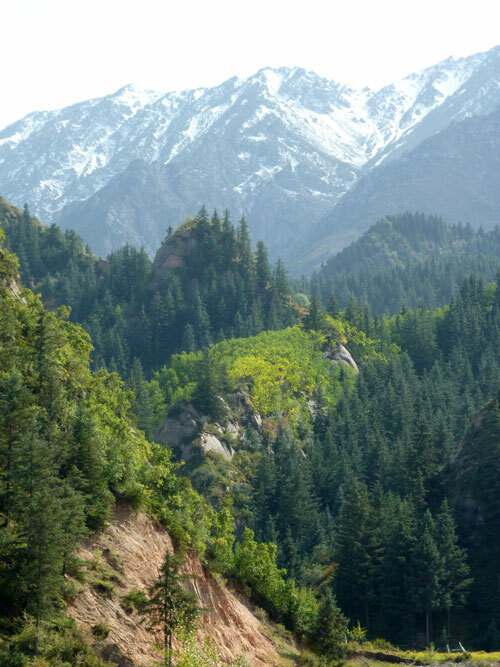 Gansu is a very appealing province with a lot of nice area to visit !! !